The Simpsons' eleventh season originally aired between September 1999 and May 2000, beginning on Sunday, September 26, 1999, with "Beyond Blunderdome". The showrunner for the 11th production season was Mike Scully. The season contained four hold-over episodes from the season 10 (AABF) production line. Towards the end of the production of season 10, voice actress Maggie Roswell, who voiced Helen Lovejoy, Maude Flanders and Miss Hoover, among others, left the show because of a contract dispute. She returned to the show in season 14. As a result of Roswell's leaving, Marcia Mitzman Gaven was brought to voice many of her characters, but it was decided to kill off Maude Flanders in the episode "Alone Again, Natura-diddily" to open new storylines for that episode. Marcia Mitzman Gaven started voicing Roswell's characters in hold-over season 10 episode "Brother's Little Helper". Writers credited with episodes in the 11th season include Al Jean, Dan Greaney, Donick Cary, Tim Long, Ian Maxtone-Graham, Carolyn Omine, Mike Scully, Matt Selman, John Swartzwelder and George Meyer. Animation directors included Bob Anderson, Mike B. Anderson, Mark Kirkland, Lance Kramer, Nancy Kruse, Lauren MacMullan, Pete Michels, Steven Dean Moore, Matthew Nastuk, Michael Polcino and Jim Reardon. The main cast consisted of Dan Castellaneta (Homer Simpson, Grampa Simpson, Krusty the Clown amongst others), Julie Kavner (Marge Simpson), Nancy Cartwright (Bart Simpson, Ralph Wiggum, Nelson Muntz), Yeardley Smith (Lisa Simpson), Hank Azaria (Moe Szyslak, Apu, Chief Wiggum, amongst others) and Harry Shearer (Ned Flanders, Mr. Burns, Principal Skinner, amongst others). Other cast members included Marcia Wallace (Edna Krabappel), Pamela Hayden (Milhouse Van Houten, amongst others), Tress MacNeille (Agnes Skinner, amongst others), Russi Taylor (Martin Prince) and Karl Wiedergott (additional characters). Aside from winning several awards in 2000, The Simpsons family themselves were awarded on January 14, 2000, their own star on Hollywood's Walk of Fame at 7021 Hollywood Boulevard. The 11th season itself gathered an Emmy Award for Outstanding Animated Program, as well as an Annie Award for Outstanding Achievement in a Primetime or Late Night Animated Television Program, and a British Comedy Award for Best International Comedy TV Show. Alf Clausen also received a 2000 Annie Award for Outstanding Individual Achievement for Music in an Animated Television Production for his work on the episode "Behind the Laughter". In the same year, "Treehouse of Horror X" won the CINE Golden Eagle Award. In 2000, music editor Bob Beecher was nominated for the Golden Reel Award for "Treehouse of Horror X". At the Prism Awards, "Days of Wine and D'oh'ses" received a commendation in the Comedy Series Episode category in 2001 for its frank depiction of alcoholism and drug rehabilitation. The show was also nominated for a Blimp Award in the Favorite Cartoon category at the 2000 Kids' Choice Awards, as well as for the Teen Choice Award in the category Choice TV Show — Comedy. The show ranked 41st in the seasonal ratings making it the second highest rated show on Fox that season after Malcolm in the Middle, getting an 18-49 Nielsen Rating of 8.2//13. After destroying an "Elec-Taurus" electric car in a test run, the Simpsons are given free tickets to Mel Gibson's new film, a remake of Mr. Smith Goes to Washington. Mel Gibson, however, laments his current role without violence and wants someone to give him criticism. When Homer sees Mel talking with Marge, he gives Mel a brutal review, leading Mel to believe that Homer is the only man brave enough to give suggestions. As a result, he hires him to create a better ending. However, when the ending proves to be too controversial, Mel and Homer end up on the run from studio executives with the film. Bart is diagnosed with Attention Deficit Disorder and prescribed a Ritalin-esque drug called Focusyn. At first, the drug makes Bart well-behaved and intellectual, but soon, Bart becomes paranoid, claiming that there are satellites owned by Major League Baseball that are spying on the town. When ordered to stop, Bart refuses, devours a few hundred, and proves his theory right by destroying the satellite with a tank. All is restored when Bart goes back to his ordinary pills. Homer becomes a food critic for a Springfield newspaper and ends up annoying the restaurant owners of Springfield after he makes negative reviews just to be mean, advice he took from fellow critics. Springfield's restaurant owners then attempt to kill Homer by feeding him a poisoned éclair. Intro: The Simpsons (all dressed as characters from previous Treehouse of Horror episodes, save Lisa, who is an axe murder victim) watch Kang and Kodos's lame attempt at a Halloween variety show. I Know What You Diddily-Iddily-Did – In this parody of I Know What You Did Last Summer, the Simpsons accidentally run over and kill Ned Flanders, and end up getting away with murder -- until someone (or something) haunts them with claims that he witnessed the crime. Desperately Xeeking Xena (a.k.a. "Stretch Dude and Clobber Girl in: 'Enter the Collector'") – Bart and Lisa gain super powers (Bart gains the ability to stretch while Lisa becomes super-strong) after a freak accident during a candy inspection on Halloween Night in the Springfield Elementary School gym and must save Lucy Lawless (dressed as Xena) from the Collector (Comic Book Guy). Life's a Glitch, Then You Die – After Homer forgets to make all the computers at the nuclear plant Y2K-compliant, the Y2K bug spreads to every computer and electronic device in the world, causing a technological apocalypse. Homer becomes a local celebrity after bowling a 300 game, but his fame quickly fades as "yesterday's news". After a botched suicide attempt foiled by Otto, Homer decides to spend time with Maggie after seeing Ron Howard spend time with his children. When Homer tries to teach Maggie swimming, he fails due to her mistrust of him, and has to pulled out the beach by Maggie. Eventually, Homer brings Maggie to a bowling game, where she bowls a perfect game. After Manjula gives birth to octuplets that were the result of fertility drugs, she and Apu unintentionally allow a zookeeper to exploit their babies in exchange for help after corporate sponsors abandon them for a mom that has given birth to nontuplets in Shelbyville. After a failed rescue attempt by Homer and Apu, the zoo keeper agrees to return the babies only if Butch Patrick and Homer ride a tricycle dressed as Eddie Munster on stage while attacked by cobras. Homer wins a Harley-Davidson motorcycle at a fifties dancing contest and starts his own biker gang, naming it "Hell's Satans". However, this attracts the real biker gang called "Hell's Satans" to crash at their house. However, after a while, they begin to appreciate Marge, who takes care of them, and kidnaps her. Homer tracks them down and scuffles with Meathook, the leader. At Marge's suggestion, the gang settles down and lives normal lives. While the Simpson family goes skiing, Marge remains at the ski lodge due to her fear of the sport, only to have her leg broken by a falling clock. As a result, while hospitalized, Marge leaves Lisa to deal with the slovenly Bart and Homer, who do nothing but take their toll on their house. In a desperate attempt to motivate them, she pulls a prank suggested by the ghost of Lucille Ball on Bart and Homer by making it look like they have leprosy. At Ned Flanders' suggestion, Bart and Homer end up in Hawaii; with them gone, Lisa finishes cleaning the house as Marge arrives home, her cast off. The pair then go to retrieve Homer and Bart, who are enjoying themselves despite the shock therapy. Bart believes he has the power to heal others through faith after removing a bucket glued to Homer's head. However, when Bart knocks Milhouse's glasses off in order to cure his myopia, Milhouse is nearly run over by a truck that he thinks is a dog as he cannot see without his glasses. Consequently, Bart, feeling guilty, ends his career as a faith healer. Meanwhile, Homer creates a homecoming game float for Springfield University. However, he soon forgets about it, and accidentally injures the star player, Anton Lubchenko. After getting in trouble with Fat Tony, Homer is saved when Lubchenko sacrifices his leg to win the game; the leg is surgically reattached by Doctor Hibbert, who is relieved at the end of Bart's healing career. Mr. Burns goes to the Mayo Clinic for a checkup after being declared the oldest man in Springfield, leaving the Simpsons to house-sit for him and Homer to take advantage of living as a rich man. However, when Homer wants to throw a party, he goes to Moe's, where he must buy the alcohol in international waters as it is Sunday before 2 PM. There, they are captured by Chinese pirates. Later, Burns discovers that as a result of having every disease in existence, he is perfectly healthy, as all the germs simply cancel each other out. Consequently, he returns and kicks out the Simpsons, who have not even enjoyed being rich, causing Homer to be extremely bitter and resentful. The Simpsons rescue a diving horse named Duncan from abuse and keep him as a pet (despite Comic Book Guy's protest that the Simpsons have done this before), but when the cost of upkeeping the horse rises, Homer and Bart train Duncan to be a racing horse. Meanwhile, Lisa is upset over her school losing the band competition to Ogdenville unfairly at the state fair and writes a letter to Bill Clinton in protest. Maude Flanders is killed in a freak accident during a stock car race, devastating Ned and prompting Homer to find a new woman for his grieving neighbor. However, Ned begins losing his faith in God before being prompted back by a Christian rock band. Homer gets in trouble with PBS after confessing he does not have $10,000 to give them for their pledge drive--and ends up a missionary on a South Pacific island. Barney realizes how much of a pathetic drunk he is after watching his birthday party video and decides to give up alcohol forever, which does not sit well with Homer. Meanwhile, Bart and Lisa work together to take a memorable photo for a new phone book cover contest. Homer has a nervous breakdown when it is revealed on a quiz that he only has three years left to live. To calm him down, the family goes to Florida for vacation--and end up in the middle of a raucous spring break, where Homer joins in on the party and ends up getting himself and his family in trouble for killing the county's beloved mascot: an alligator named Captain Jack. In a parody of VH1's Behind the Music, viewers take an inside look at The Simpsons' rise to fame--and the many scandals, feuds and break-ups that threatened to end the show and split up the family. The DVD boxset for Season 11 was released by 20th Century Fox Home Entertainment in the United States and Canada on October 7, 2008, eight years after it had completed broadcast on television, in the UK on October 6, 2008, and in Australia on November 5, 2008. The special features include deleted scenes, storyboards/animatics, and commentaries. 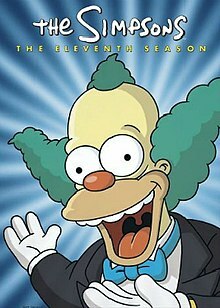 The set was released in two different packagings: a standard rectangular cardboard box featuring Krusty the Clown on the cover, and a "limited edition" plastic packaging molded to look like Krusty's head. This is first time that a character-themed packaging doesn't feature a main character from The Simpsons family. Unlike the previous seasons, the Collector's Edition packaging is a removable molded face attached to a cardboard sleeve, as opposed to a fully plastic clamshell. Both versions have changed from a digipak style of disc tray in previous seasons, to an accordion-style series of cardboard sleeves into which the discs slide. Following the release of the set, there were a number of complaints regarding the style of packaging due to the fact that the cardboard packaging may scratch the discs; David Lambert of TVShowsOnDVD.com described the set as "functionally defective." Featurette: "The Many Faces of Krusty"
Featurette: "A Star on Hollywood Boulevard"
Groening, Matt; McCann, Jesse Leon (2002). Simpsons: Beyond Forever! : a Complete Guide to Our Favorite Family...Still Continued. Bt Bound. ISBN 9780613621601. ^ a b Groening, p. 34. ^ a b "28th Annual Annie: Award Nominees and Winners (2000)". Annie Award. Retrieved 1 January 2014. ^ "The British Comedy Awards — Past Winners 2000". The British Comedy Awards. Retrieved 1 January 2014. ^ "Past Golden Reel Awards". Motion Picture Sound Editors. Archived from the original on 2007-03-05. Retrieved 2007-10-17. ^ "PRISM Commendations". Entertainment Industries Council. Retrieved 2008-04-27. ^ "Kids Choice Awards USA 2000". IMDb.com. Retrieved 2016-09-15. ^ "Teen Choice Awards 2000". IMDb.com. Retrieved 2016-09-15. ^ "TV Ratings 1999-2000". Fbibler.chez.com. 2002-07-26. Retrieved 2016-09-15. ^ "Quick end to series wounds NBC's ratings". Sun-Sentinel. MediaNews Group. Associated Press. November 4, 1999. p. 4E. ^ Associated Press (2000-02-06). "Weekly Nielsen Ratings". The Stuart News. p. P10. ^ Associated Press (2000-02-10). "'Millionarie' is a Nielsen darling once again". The Orlando Sentinel. p. E6. ^ Associated Press (2000-02-27). "Weekly Nielsen Ratings". The Stuart News. p. P10. ^ Bauder, David (Associated Press) (2000-03-23). "'Millionaire' lifts ratings – for shows airing after it". The Augusta Chronicle. p. B04. ^ Associated Press (2000-05-04). "ABC, NBC dead even in prime-time ratings". Sun-Sentinel. p. 4E. ^ "The Simpsons — The Complete 11th Season (Lisa Head)". TVShowsOnDVD.com. Archived from the original on 2008-12-09. Retrieved 2009-04-11. ^ Lambert, David (2008-10-21). "The Simpsons — Editorial: Season 11: Worst... Packaging... Ever!". TVShowsOnDVD.com. Archived from the original on 2009-01-29. Retrieved 2009-01-13. ^ a b c d e Lambert, David. "Here's Krusty... The Simpsons: The Complete Eleventh Season DVD collection". TVShowsOnDVD.com. Archived from the original on 2008-09-04. Retrieved 2008-09-02.